Once again, our power went out and I have all doors open to allow for a cross breeze. I guess we’re lucky to be on an island that is not currently undergoing a–well, whatever you call a total absence of air movement out at sea. (Had that word just a moment ago, but it flew off just as I got to where I wanted to use it. Oh, well.) Unfortunately, our “villa” community doesn’t have a backup generator, so the A/C (or airco, as it is locally called) is off. Hence the gratitude for the cross breezes. But it’s still hot. Which turned out to have a revelation. 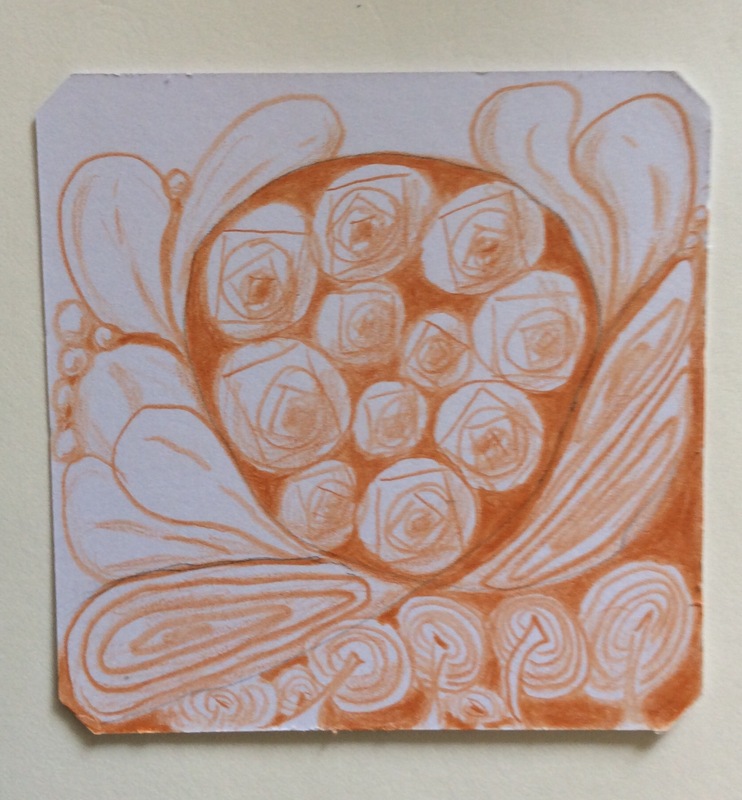 Last night, I was working on a Zentangle tile, but decided to use colored pencil instead of the Micron pen. I already knew erasure wouldn’t work well on the tile surface, but that was OK. Instead of using my Prismacolor Premier pencils, I grabbed the less expensive Prismacolor Scholar pack and set to work. I made two novice blunders right off: I drew my string (boundaries) using graphite pencil instead of the color pencil; and I didn’t sharpen the pencil soon enough. The graphite pencil lines seem to have been enhanced by the color pencil (terra cotta, if you’re interested). The pencil lines actually darkened considerably as I worked over them. Or maybe the terra cotta was darkened by the graphite, which is more likely. Either way, by the time I noticed what was going on, it was too late for erasure without destroying what I had already done. So, lesson learned #1: when using colored pencil, draw the strings lightly in the colors that will be used. As I drew, I began to realize that, unlike when using pen, a pencil needs to be sharpened often. That’s a lesson I am not good with even when I sketch in graphite, but it seems more important to pay attention to the keenness of the point when working in colored pencil. I knew that the Scholar line very, very quickly loses sharpness of point, but didn’t want to stop in the middle of a pattern just to hone a pencil. Result: thick and blurry lines as the pencil point vanished. Lesson learned #2: either use a higher quality pencil that does not dull so quickly, or sharpen after two or three iterations of a pattern; and definitely do not start a new motif without sharpening. Maybe I can use the excuse that I was drawing late at night, with inadequate light and very little patience. However, I knew about sharpening, and I knew the point was dulling. I just didn’t stop. Today, when the power went off again (a daily occurrence, although not always at the same time; and yesterday we had two outages–one that started just before midday, and another in the late evening), I thought I should finish up the tile I started last night before succumbing to sleepiness. Why I would want to draw in this heat is beyond me–I should have been outside where cooling breezes blew more strongly than my home’s cross breezes. The tile, however, was more appealing at the moment. What I learned, though, is that the heat helped the wax-based colored pencil flow better, not only as I drew or enhanced, but also as I laid down color. Recently, I had learned of an expensive drawing board that has hot and cold spots in it, with the idea of melting the colored pencil for a smoother and flowing finish. When I saw the price of the Icharus, I decided it wasn’t a tool I am ready to add to my arsenal. But I think I achieved a similar effect because of our weather. In the heat, not only did the color seem to melt off my pencil point (yes, yes–I kept sharpening it; last night’s lesson paid off), but the surrounding color seemed to melt into itself as I worked. The tile as pictured may not be quite done. I need to see what happens as I apply more layers of color to the background. The motifs will not be changed, as my tracing abilities are sorely lacking. There is no good way of getting rid of the graphite pencil marks, even though I drew them so lightly–or thought I did. And I don’t want to work the drawing too much, as it will get both too busy and too sloppy. But I do want to see whether I get a big wax bloom from the heated flow of the pencil, and I want to see if the flowing areas of color hold. So much to discover… So neat to be a novice with the desire to see What If…? This entry was posted in Art, Learning art, Zentangle and tagged art mistakes, discovery, learning from mistakes, novice artist. Bookmark the permalink.